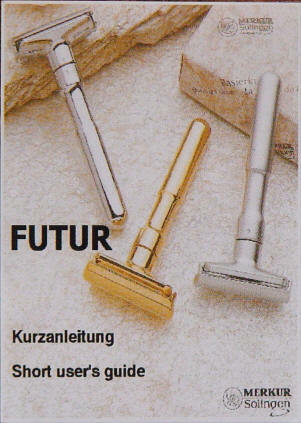 The Futur opens by pushing the top cap off as shown starting with a side upward movement. This traditional and fully adjustable razor is second only to the Vision in weight and performance. A great way to find the closest and most comfortable shave. 4 3/8 inch total razor length. Weight is 4.2 ounce. The numbers 1 through 6 are used to adjust the blade gap - 1 setting is most closed, 6 setting is most open.